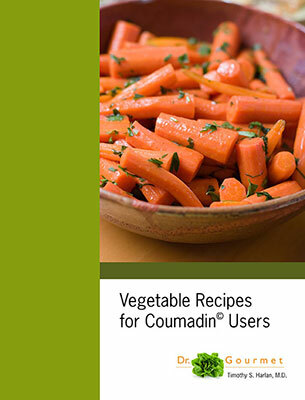 The healthy eating guide for Coumadin (warfarin) users, in eBook (PDF) format. If you are a registered user of the Dr. Gourmet Bookstore you can return to the store and download your document again within one week of your purchase. You may download your purchase again up to three times. This book has been a great help to me. The education I’ve gotten from it, the menus, the recipes, the lists of high, moderate, low Vitamin K foods. 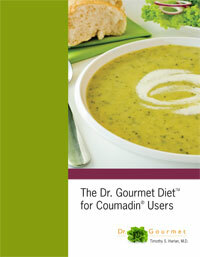 I would highly recommend this in the pdf format to anyone on Coumadin.